APPW Edition 3 offers identification support for all aquatic plants cultivated globally for the trade as of 2018, including 270 genera. Also included are fact sheets, a key, a filterable image gallery, an illustrated glossary, and additional background information. 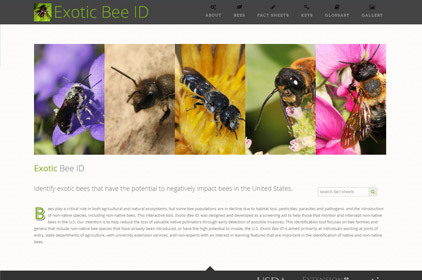 Exotic Bee ID assists users in the screening and identification of bees that may have been introduced, or have the high potential to invade, the U.S. The website includes fact sheets, images, keys, specimen prep instructions, an illustrated glossary, and more. Part of the Palm Resource, this website includes fact sheets and images for the 23 palm pest genera of the Family Chrysomelidae, which all fall in the former subfamily Hispinae. 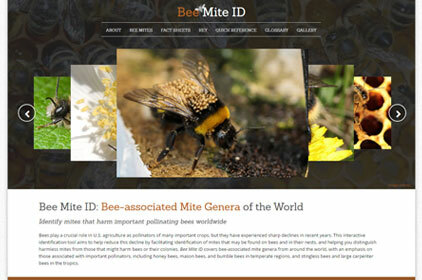 Bee Mite ID enables users to identify mites that may be found on bees or in their nests and to distinguish harmful from non-harmful mites. Included are a key, fact sheets, quick-reference guides, morphology guides, a filterable image gallery, and a glossary. 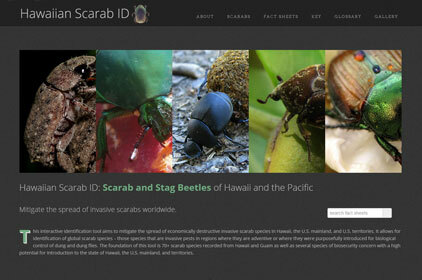 Hawaiian Scarab ID includes over 70 native, established, and possibly invasive scarab species from the islands of the Pacific, particularly Hawaii and Guam. 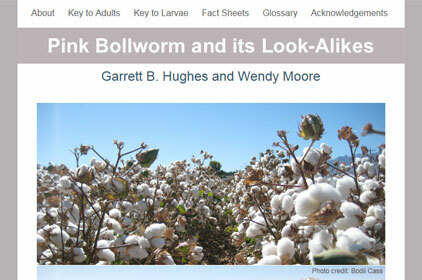 Included are a key, fact sheets, behavioral videos, an anatomy guide, a sortable image gallery, and a glossary, as well as DNA barcode data to help identify larvae. 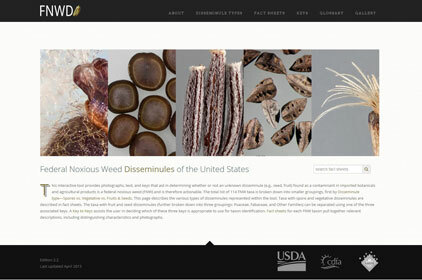 This interactive tool provides images, text, and keys that aid in determining whether or not an unknown disseminule (e.g., seed, fruit) is a federal noxious weed (FNW) and is therefore actionable. The tool includes three keys, a key to keys, fact sheets, an image gallery, and an illustrated glossary. Grasshoppers of the Western U.S., Edition 4 offers keys to identify both adult and pre-adult stages of many of the most commonly encountered grasshoppers in the western U.S., as well as fact sheets, a sortable image gallery, and an illustrated glossary. 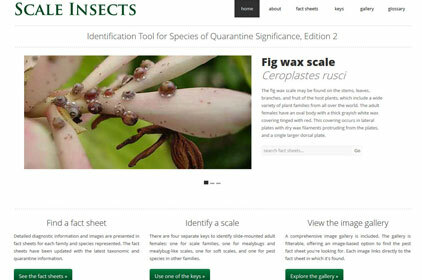 This tool is designed to help the user identify almost any scale insect to family, and in some cases to species, without the need for expertise in the group. The tool emphasizes scale taxa important to the U.S. ports of entry. 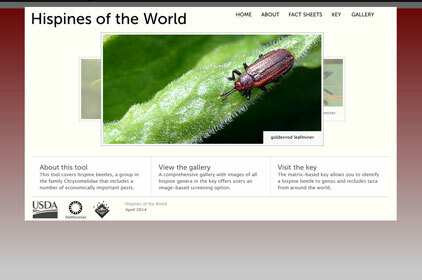 It includes four interactive keys, fact sheets, a glossary, and a sortable image gallery. This tool contains an interactive key, fact sheets, an image gallery, and an illustrated guide to hispine morphology. It includes 195 genera from the former subfamily Hispinae (family Chrysomelidae), now included within the subfamily Cassidinae. 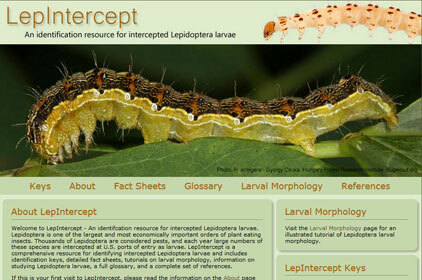 LepIntercept is a comprehensive resource for identifying intercepted Lepidoptera larvae and includes identification keys, detailed fact sheets, tutorials on larval morphology, information on studying Lepidoptera larvae, a full glossary, and a complete set of references. 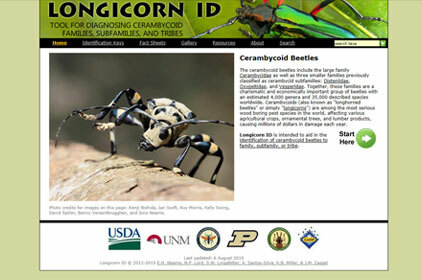 Longicorn ID is intended to aid in the identification of cerambycoid or longhorned beetles to family, subfamily, or tribe. The site now includes over 10 keys, most of which are interactive, as well as fact sheets, and image gallery, references, and other informational pages. This tool is designed to help identify larval and adult Microlepidoptera that feed on plants in the family Solanaceae, focusing on species from Florida and the Gulf Coast of the U.S. Included are a key, fact sheets, glossary, gallery, and a specimen preparation guide. This tool is designed to help non-experts identify any flat mite to the taxonomic level of genus, and in some cases to species. 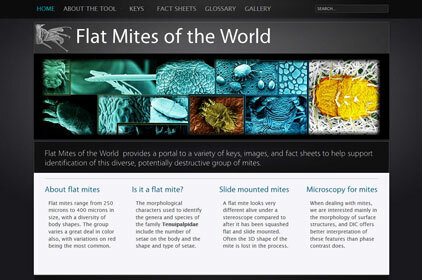 The tool includes four keys, fact sheets, a glossary, an image gallery, and a wealth of background information about flat mites and microscopy. 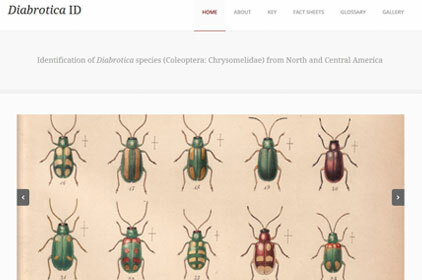 Diabrotica ID is designed to support non-experts in the identification of 112 Diabrotica species that originate from North and Central America. The tool includes a key, fact sheets, a sortable image gallery, and a glossary. Antkey is designed for non-specialists and includes over 115 ant species that are introduced, invasive, or commonly intercepted in the U.S. 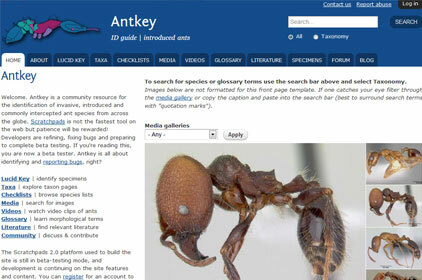 Features include an interactive key, fact sheets, a searchable media collection, video clips, a fully illustrated glossary, a searchable database of introduced ant literature, and more. 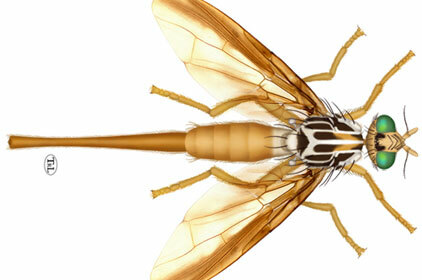 This website attempts to bring together in a single package all of the relevant taxonomic information for these important genera of fruit flies. It provides a choice of two electronic keys (Intkey or Lucid), and detailed descriptions and images of each species are also included, as well as a morphological atlas. Citrus Pests is aimed primarily at extension agents, inspectors, and other plant professionals with access to a light microscope and hand lens. 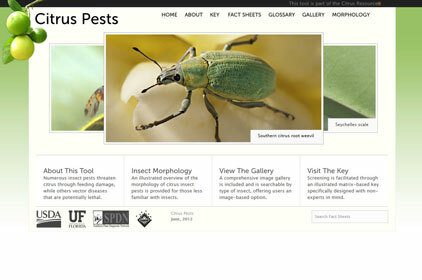 It offers screening support for over 50 important insect pests of citrus in the U.S. A key, fact sheets, illustrated morphology guide, glossary, and sortable image gallery are included. AphID includes a key to the 66 most polyphagous and cosmopolitan aphid species. 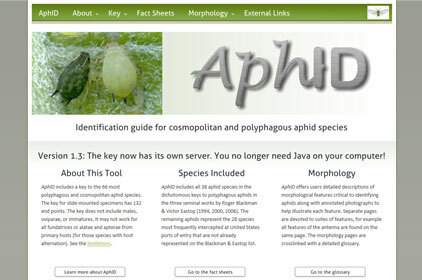 AphID also offers users detailed descriptions of morphological features critical to identifying aphids along with annotated photographs to help illustrate each feature, as well as detailed fact sheets and a glossary of terms. 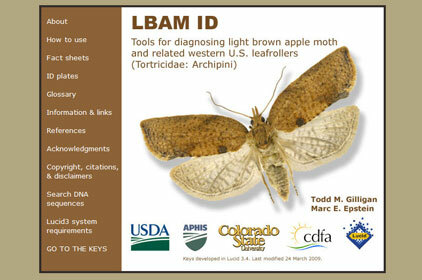 This tool includes resources for identifying adults and larvae of tortricids that threaten agriculture in the U.S. 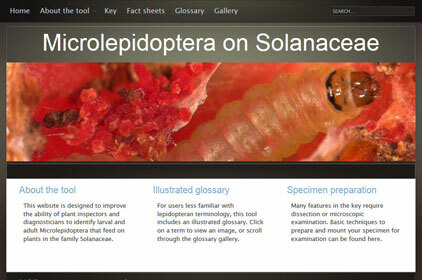 Features include detailed fact sheets, two interactive keys, dissection guides, a glossary, and an image gallery. A DNA barcode database allows confirmation of identifications. 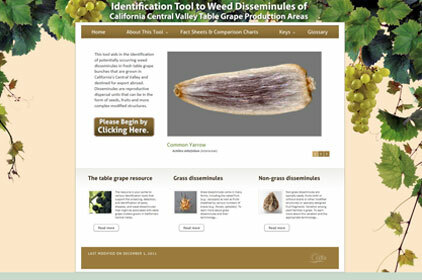 This tool aids in the identification of weed disseminules that may occur in fresh table grape bunches grown in California's Central Valley. Features include two keys, fact sheets and comparison charts, a glossary, and guides to disseminule types. This tool was created to support export of table grapes from California to Australia and New Zealand. 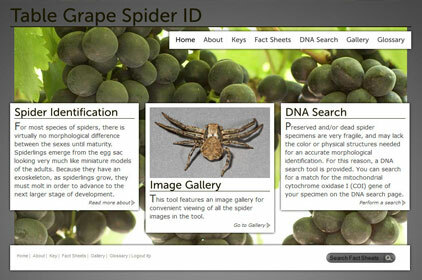 Included are keys for identifying spiders and spider egg sacs that may be found in table grape bunches from the Central Valley, fact sheets, a DNA search page, a glossary, and an image gallery. 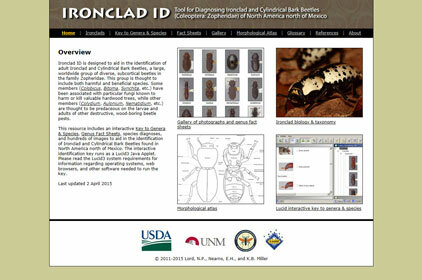 Ironclad ID is designed to aid in the identification of adult ironclad and cylindrical bark beetles in the family Zopheridae. Features include a key to genera and species, fact sheets, an image gallery, a morphological atlas, biology and taxonomy information, and a glossary. 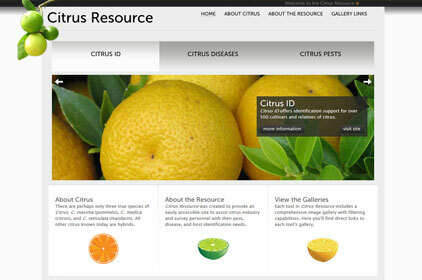 Citrus Resource, a commodity-based identification resource, was created to provide growers, the industry, and those associated with citrus pest and disease detection an easily accessible portal for tools to assist with their identification needs. The site includes background info and links to all associated tools. 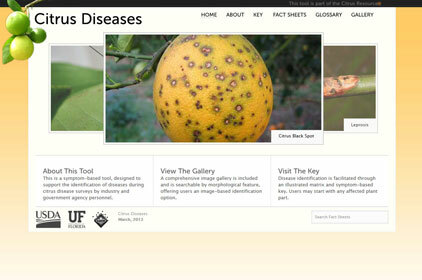 Citrus Diseases provides support for symptom-based screening and identification of citrus diseases that were known in the United States as of 2011, as well as those of immediate concern. The tool includes a symptom-based key, fact sheets, a glossary, and a sortable image gallery. 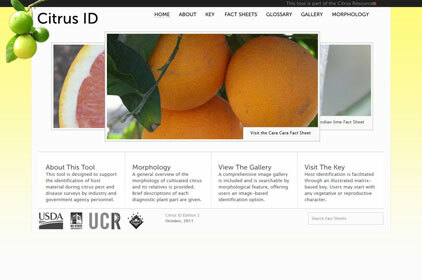 Citrus ID facilitates identification of over 500 citrus cultivars and relatives to at least the cultivar group level within citrus (e.g., sweet oranges, sour oranges, etc. ), if not beyond for select cultivars. Included are a key, fact sheets, a sortable image gallery, and a glossary. 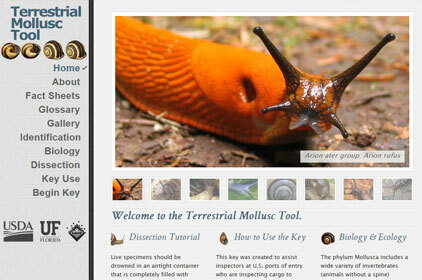 Terrestrial Mollusc Tool was specifically designed to assist in the identification of adult terrestrial slugs and snails of agricultural importance and quarantine significance. It includes a key, fact sheets, biology and ecology info, a dissection guide, a glossary, and an image gallery. 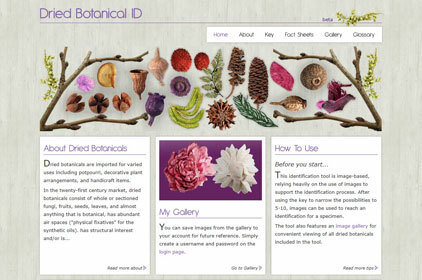 This unique, image-based tool allows identification of a variety of dried botanicals, often used in potpourri, decorative plant arrangements, and handicrafts. In addition to the key and fact sheets, the tool includes an interactive image gallery that allows users to easily compare images and save them for later reference. 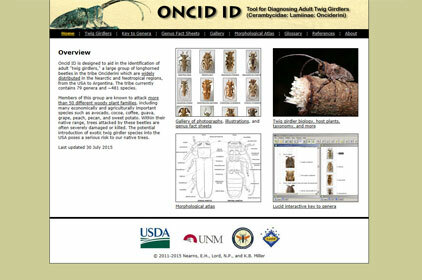 Oncid ID is designed to aid in the identification of adult "twig girdlers," a large group of longhorned beetles in the tribe Onciderini which are widely distributed from the U.S. to Argentina. Features include a key, fact sheets, image gallery, biology and taxonomy info, a morphological atlas, a glossary, and an image gallery. 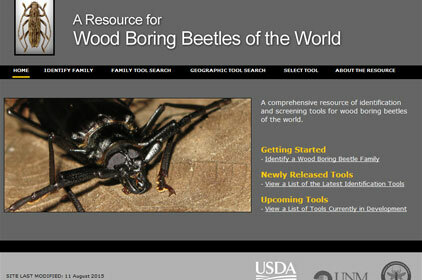 This site is a portal for identification and screening tools for wood boring beetles of the world. The site focuses on the nine families considered wood boring beetles: those taxa that bore into and develop within sound wood. You can search by family, geographic coverage, or release date. Part of the Palm Resource, Identifying Commonly Cultivated Palms supports users in differentiating among 82 palm species that are commonly cultivated in the U.S. Fact sheets for each species are included, as well as a key, glossary, illustrated morphology guide, and image gallery. 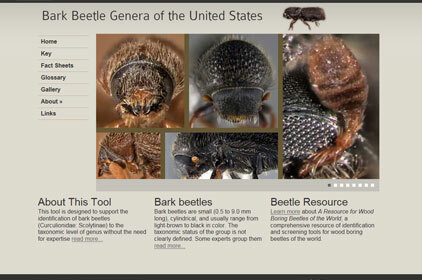 Bark Beetle Genera of the U.S. This tool is designed to help identify bark beetles (Curculionidae: Scolytinae) to the taxonomic level of genus without the need for expertise in the group. It includes the genera that occur in the continental U.S. In addition to the key and fact sheets, this tool has an image gallery and a glossary. Xyleborini is the most important and species-rich tribe of ambrosia beetles. 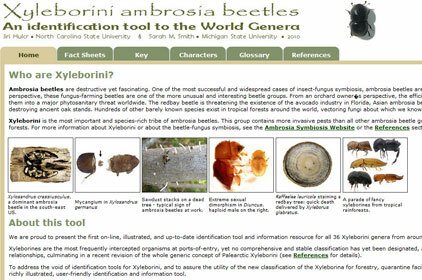 This tool provides identification support for all 36 Xyleborini genera from around the world. Features include a key, fact sheets, a morphological guide, and a glossary. 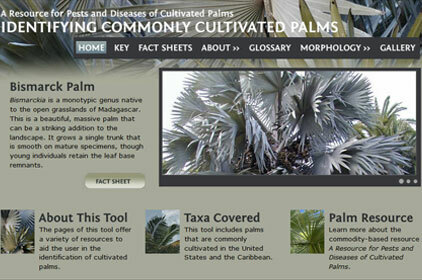 The palm resource is a portal designed to support individuals involved with commodity-based palm surveys. 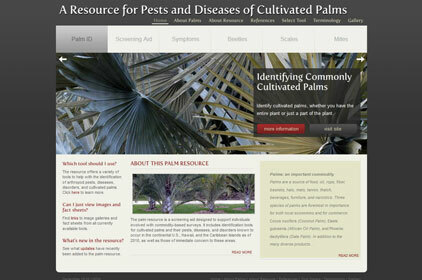 The resource includes background info and links to tools for identifying palms grown in the U.S. and Caribbean and their pests, diseases, and disorders. 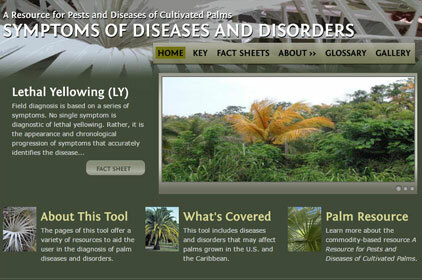 This tool, part of the Palm Resource, uses visual symptoms to help preliminarily identify palm diseases and disorders that commonly occur in the U.S. and Caribbean. 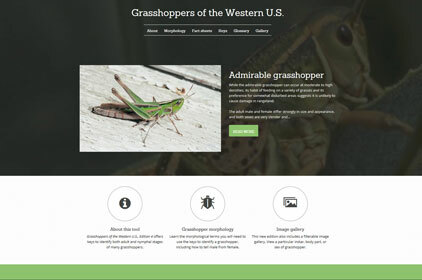 Features include a key, fact sheets, a glossary, and an image gallery. 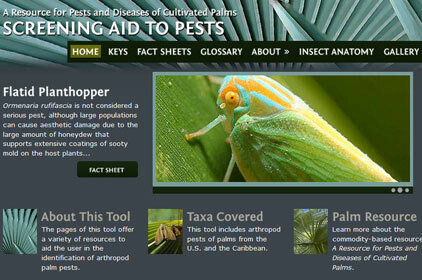 Screening Aid to Pests (SAP), part of the commodity-based Palm Resource, is aimed primarily at the novice entomologist. 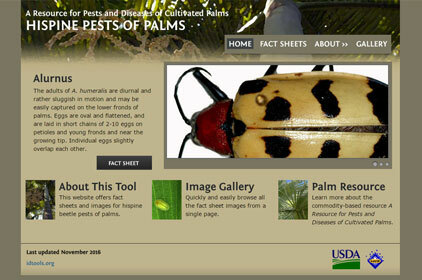 It is designed to help users determine which type of arthropod palm pest they have found and features illustrated fact sheets as well as two interactive keys, a morphology guide, and an image gallery. 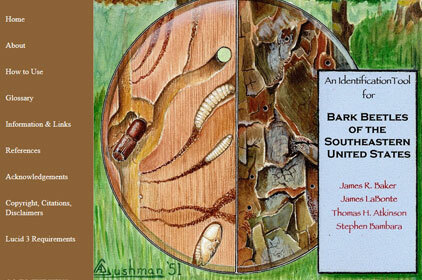 Bark Beetles of the Southeastern U.S. This website features a key that allows the user to separate genera of Curculionidae bark beetle subfamily Scolytinae, of the southeastern United States, that are classified into the two tribes Hylesinini and Scolytini. This tool was retired on March 13, 2019, because a more recent and comprehensive resource for the family Tortricidae is available. 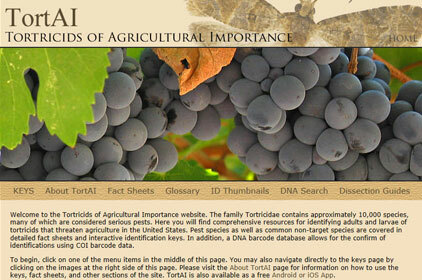 TortAI includes all the taxa and content from LBAM ID and is a more complete source of information. Visit TortAI. 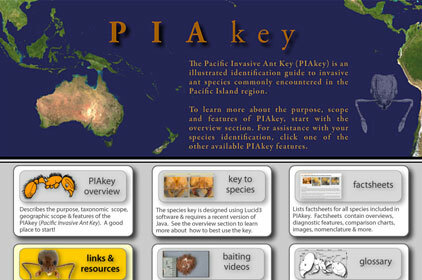 PIAkey (Pacific Invasive Ant key) is an electronic guide designed to assist users to identify invasive ant species commonly encountered in the Pacific Island region. The guide covers four subfamilies, 20 genera and 44 species, and includes a key, fact sheets, videos, comparison charts, and a glossary. 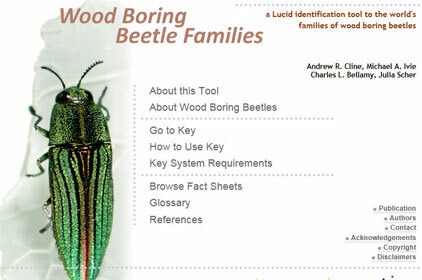 This tool allows users to differentiate among the nine families of beetles that are known to bore into and develop within sound wood. An identification key and fact sheets are provided, as well as a glossary, references, and background info. 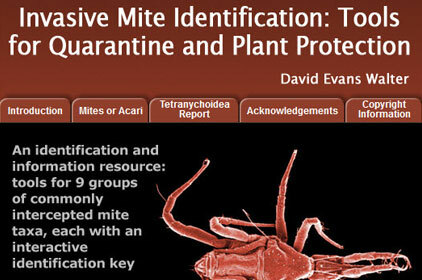 This site includes nine keys designed to provide support for every level, from training in mite anatomy and identification to advanced taxonomic support. The tool also includes many detailed informational pages, fact sheets, and a glossary. 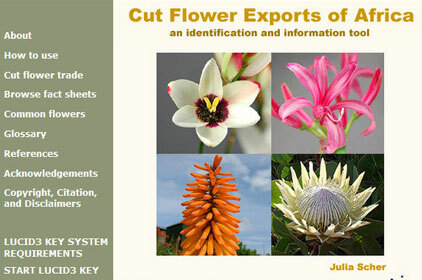 Cut Flower Exports of Africa is a tool to aid in the identification of genera of cut flowers produced in Africa and exported to major world markets. 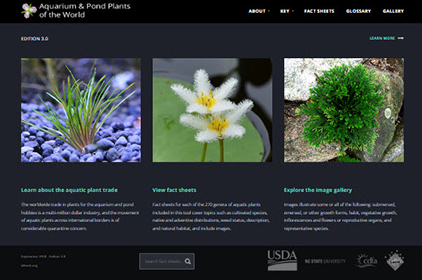 This tool includes an interactive identification key, flower images, and fact sheets. The interactive identification key runs as a Lucid3 Java applet.